This month I’ve prepared a Angry Man Tribute Mix. Craig Purvis’ Trance project in “disguise” called “Angry Man” was and is always one of my favorite unique trance styles which I’ve been supporting for the past years. With “The Last Of Us” Angry Man’s final tune came recently out on Outburst. His trance project is finished and won’t be continued. I want to honor his music with this mix. Good luck in future with your new music project(s) Craig! 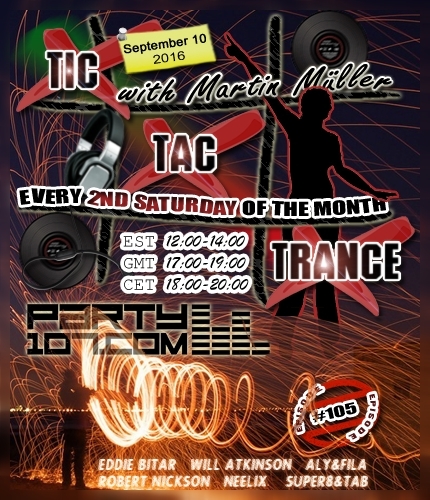 Tic Tac Trance #105 Replay available! Tic Tac Trance #105 is almost here! This episode will air on September 10 2016 on Party107.com and will feature new tunes and remixes by artists like Eddie Bitar, Will Atkinson, Aly & Fila, Robert Nickson, Neelix, Super8 & Tab and, of course, many, many more! This time I’ve prepared an uplifting & psychedelic 2 hours underground trance journey. Make sure to tune in!